So, I had an epic blog post planned for today, one in which I was going to discuss my on-going rewrite of a book that was “done” a year ago. Then my daughter fell on her face (literally) while we were walking our dogs last night and I ended up spending two hours at the ER, then another at Denny’s because she wanted late night pancakes, sausage, and ice cream. Who am I to deny? Anywho… I actually AM starting a rewrite. And good news–it’s getting easier. Know why? Because I’ve finally figured out the trick to a successful rewrite. Ready for it? You must first be willing to let go of what the story used to be. All my past struggles with rewriting stem down to one crucial mistake: I wasn’t rewriting. I was shifting, revising, tweaking, patching, replacing–anything and everything I could do to add new material while still hanging on to the essence of what the story was. And it wasn’t working. So, I’ve let go of the original story. In fact, I’m treating it as if it’s not even mine. I’m viewing it as subjectively as possible. Those words I spent all last summer slaving over? They’re simply raw material I’ve stumbled upon and hope to improve. Sure, I’ll pick up the few scenes that happen to work and fit them back in, and I’ll flesh out characters who are worthy, and maybe steal back some of the dialogue that’s particularly witty, but other than that, I’m REWRITING. Completely. And that’s good, because I’ve spent months mulling over ways to make this story what it needs to be, and I think I’ve finally got a handle on it. This is exciting! 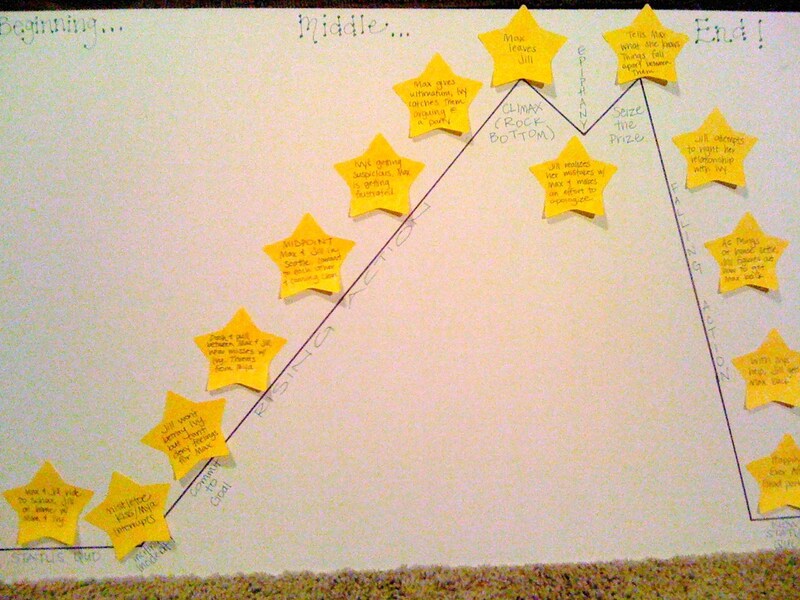 That’s poster board and Sharpie, and those star Post-It notes are the major plot points. I’ve got smaller, color-coded ones that I plan to start working on tonight, Post-Its that will stand in for subplots, character notes and setting descriptors. Hopefully my little chart will serve as a jumping off point and make this rewrite more manageable and–God willing–more fun. Have you ever attempted a major rewrite? Any tips or tricks to share? OMG that is the saddest picture ever! Her little face! Hopefully she’s feeling better today! I had to rewrite my WIP and, you’re right, the key is letting go everything you knew the story to be before. I’m still struggling with that, actually, but backwards. I said “this story isn’t THIS” but the more I rewrote, I realized it WAS, and it’s been hard to accept that. Good luck with your rewrite! I love your chart! I’m glad I’m not the only one struggling with rewriting. I’m getting whiplash thanks to all the LOVE IT and HATE IT feelings I’ve been having! Your poor daughter. I hope the pancakes and ice cream made it all better. I’m a fan of plot maps on major overhauls as well. Of course, I found that now I actually plot ahead of time, I have less problems revising too. I like rewriting better than first-drafting, I think. It’s so much easier for me to see a rewrite’s possibility than face the blank page. I really am starting to see the possibilities, and that’s so motivating! Really hoping that this baby comes away stronger (not to mention publishable!). I love post its, but I don’t use them nearly as effectively as you do! No great ideas here, but lots of support. My novel took a huge turn about a year ago, and is now about 20K words longer than it was at that time. The plot really isn’t all that different, it’s just much more complex. Thanks for the support, Kris! And yes, more complex is definitely what I’m going for here. Also, much higher stakes. 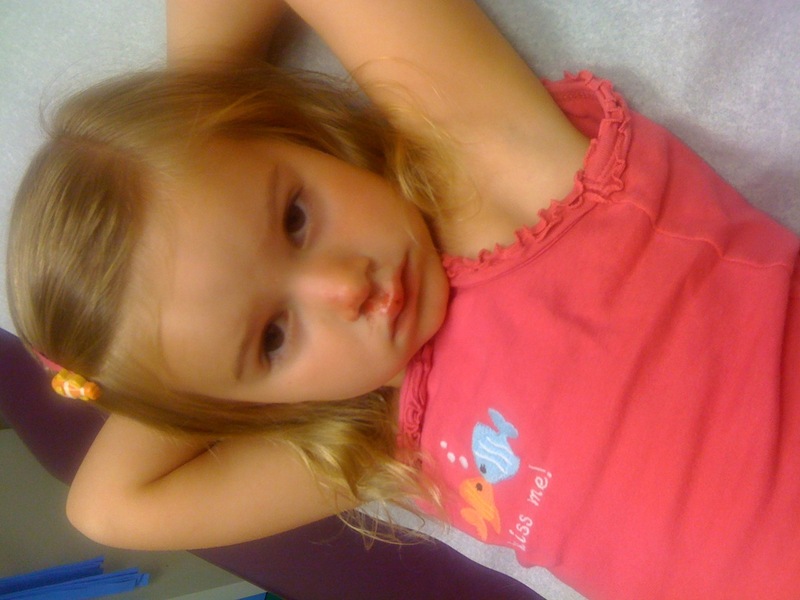 Bless her heart– that could not have been fun. I hope she’s feeling better. Awesome visual– and you are so right! I feel like “breaking up” with what a book was is very important (not that I’ve totally figured out how to do it). *nods* came to the same conclusion. You have to let go of what the story was in order for it to be come all it can be. The version of DRENCHED you read is almost entirely REWRITE, except for a few bits of scenes I meshed in and revised to death to fit. Thanks, lady! I felt better after we chatted the other day. If YOU can let go of a first version and come away with something awesome, maybe I can too! And I’m so thankfully to have your fresh perspective when this baby is ready for readers. I’m about to start one, so this was majorly insightful. Thanks! And so sad about your baby! 😦 I hope both of you are doing better. Glad to know we’ll be in the same rewrite boat together… it’s always nice to have the support and commiseration of writing friends! Aww, I hope your daughter’s doing better. 😦 “Letting go” is a phrase I need to hear constantly when I’m rewriting a story–or even just completing a revision. I grow so attached to some lines or scenes, that I keep trying to make them work–but when I finally remove them, I see how much stronger the story can be. She is doing better. Thanks, Pam! Letting go is SO HARD! Glad I’m not the only one who gets attached. You’re right about removing them–that’s the only way I’m able to see the improvements. Just get brave and DELETE! I feel your pain around rewriting. I’ve come to the same realisation myself. Kill your babies and all that.